Warren Buffett says, “The difference between successful people and unsuccessful people is that really successful people say no to almost everything.” Do you say no enough? It is necessary to filter every opportunity, project, app, program, joint venture, webinar, event, and networking event through your vision of success to determine if you should say yes or no to engaging in that activity. Activities that don’t match your goals only draw your focus away from activities that will move you closer to achieving your dreams. By saying no to others, you are saying a resounding yes to your own aspirations. Many of us have a very difficult time saying no to others. Get over it! Say yes to your future and your business more often. Do not feel like you can or have to fill every white space in your calendar with an activity or meeting. Everyone needs down time or thinking time or transition time. Whatever you want to call it, buffer room is necessary and often a sanity saver. #1 Should This Activity Be Done? This question is not as simple as it sounds because many of us are running our business on autopilot. We just go, go, go and say yes to every opportunity that comes across our path. What you need to do is be really clear about what the return on investment is on saying yes. Remember that your investment is not only money but also your time and energy. Just because a particular activity served you well in your business previously doesn’t mean it’s serving you well now. After all, your goals may have changed and along with them, your products, services, and mindset. Reevaluate the activities you’re saying yes to at least monthly. 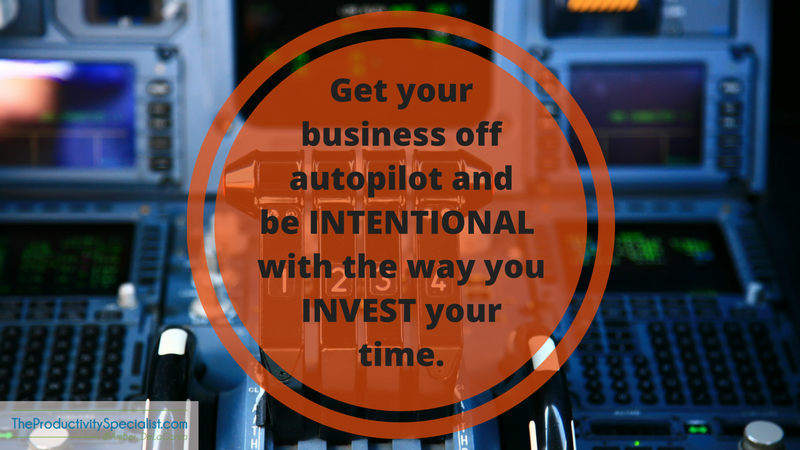 Get your business off autopilot and be intentional with the way you invest your time. #2 Is This Activity Being Completed As Efficiently As Possible? Peter Drucker said, “There is nothing as useless as doing efficiently that which should not be done at all.” Since you’ve already determined that the activity should be done by answering the first question, next you need to look at whether you are doing it with utmost efficiency. The issue again, is that we tend to run our businesses on autopilot. You might have created a spectacular system or process a long time ago then continued using it for years, if not decades, without reevaluating it to make sure it is still efficient. To reclaim time, you have complete your tasks efficiently. Let’s say your process is a series of steps and you do the process every week. Maybe it’s writing a blog article, posting to social media, or bookkeeping. No matter what area of business you have a process for, if you can reduce the number of steps in it, you will save time. And you won’t just be saving time once – you’ll be saving time every time that you complete the process. Compounded over time, think how much time you’ll be saving annually! The compounded effect of simply reducing the number of steps in a necessary activity is well worth the time it takes to figure out if you’re doing it as efficiently as possible. Trim down your processes and systems to just the essential steps. Many of you either don’t like technology and are therefore completing tasks the long and hard way (think sending snail mail instead of just emailing your client a response to their question) or you have so much technology that you don’t take the time to learn it and use it correctly. Determine if technology can be used to create efficiency for that step, task or activity. The activity in question may be necessary but does it need to be done as frequently as you’re doing it? If you were to reduce the frequency in which you do repetitive activities, you would save a great deal of time over the course of a year. By examining the necessity of an activity’s frequency, you may find that a daily activity need only be done twice weekly and a weekly activity need only be done monthly. The technological age we live in enables us to automate so many facets of our lives but we often don’t take the time to set it up properly. You can automate social media, business email marketing, email responders, and so many other tasks or processes your business depends on. Take advantage of templates whenever it makes sense. Once you put your focus and energy into creating one, you can use it again and again with minor tweaks. Don’t waste time writing the same email response from scratch to your clients’ questions time after time. That wastes your time, energy, and thinking power. Instead, take time to initially determine what reply you want to give to a particular question and save it as a template. Then you will only have to customize the pre-written template to fit each individual situation. Checklists save you time simply for the fact that they tell you what to do next so you don’t have to waste time wondering and thinking about what you should undertake next. They make it easy to not multitask, lose or forget tasks, or miss steps because they clearly lay out each step that needs to be accomplished. The process of utilizing a checklist ensures you mark off what you have done, shows you what still needs to be done, and eases you into transitioning from one task to the next. Checklists also make delegating easier because they bring attention to what needs to be accomplished instead of you having to sift through all of the tasks spinning around in your head to decide what to delegate. #3 Can This Activity Be Delegated? Generally, entrepreneurs tend to answer this question no because they think they can do it better than anyone else. After all, they’re the boss for a reason. Be really honest with yourself though. Do you want to continue doing the activity for the sheer reason that you simply enjoy doing it, have always done it and don’t like change, or you think it’s just safer that you do it? Or maybe you do it because you don’t have the money to hire out. There are plenty of reasons entrepreneurs refuse to delegate activities. The reasons need to be reasonable or you’re only hurting your business’ potential. The truth is that to invest in your business, you have to invest in others and trust them to accomplish certain tasks. Weigh the opportunity cost by thinking about all the activities you could be doing that only you are qualified for, instead of the tasks you’re doing that others could be completing. One of my client’s mottos is Move it from my to-do list to their to-learn list. What great words to live by! When you spend an hour training someone to do a repetitive task that normally only take you 30 minutes, you are not wasting 30 minutes because you will never have to do that task again. You will have reclaimed those 30 minutes to work on other higher-value tasks time and time again when they complete the activity instead of you. So who should you delegate to? If you have a full-time assistant, he or she is the perfect person to delegate tasks to. After all, you hired them because they have the skill sets to meet your demands and a personality you can effectively manage and trust. If you can’t afford a full-time assistant or don’t have a need for an assistant that many hours each week, that’s ok. You have other options. If you don’t have the resources to finance or enough work to give a full-time assistant, you could possibly share one. I actually share my assistant. She works a few days a week for me and a couple of days a week for a past client of mine. The situation is perfect for her because she has full-time employment. It’s perfect for us because we both need an assistant but neither one of us can commit to having one full-time. Nowadays you can hire someone to do just about anything online for a fair amount so perhaps hiring a virtual assistant for a set number of hours per week is a practical solution for you. Many companies now offer such services. Certain tasks warrant delegating but don’t justify hiring an assistant. Contract out specific projects to talented individuals who specialize in such tasks as website building, graphic design, content writing, and bookkeeping. The barter system is alive and well in the business world. Consider trading a talent you have for a talent you need. Trading services is a great way for both parties to accomplish a necessary task without spending financial resources. Need your website created? Offer your photography services if that’s your strength. Need a logo designed? Offer your marketing services if that’s your strength. Consistently search out other entrepreneurs who are often in need of your services and you’ll establish a network of people you can potentially delegate tasks to. Stop telling yourself you don’t have enough time. You have the same amount of time as people who accomplish far more than you do on a daily basis. Take action changing how you use your time. Every minute spent is a minute you’ll never get back so make each one count. Ask yourself those three questions for each recurring task in your schedule so you can find out where you are misusing your time and change your ways. You can then repurpose that time and put it toward accomplishing both your business and personal goals. If you want more time for what matters most, you have to make your time count!